Having trouble reading this email? View it in your browser. Unsubscribe Instantly. JCJ offers an alternative to carbon offsetting. Our projects empower youth leaders of the future. 1. make a direct debit or one-off payment to our bank account. 2. send a cheque to Secretary, Journeys for Climate Justice, 4 Belmont St, Surrey Hills Vic 3127. Please include your name, and send us an email. These options are also available on our website. Your dues pay for our admin costs - room hire, Consumer Affairs registration fee, AGM expenses and more. Please note that our admin expenses are banked separately to project funds that support youth Journeys and other international initiatives. A prompt payment would be appreciated. Why not make a direct debit now? Add your name please to the payment. Send a cheque to Secretary, Journeys for Climate Justice, 4 Belmont St, Surrey Hills Victoria 3127, Australia. If Paypal is not working, pls use other means or check again in a few days. Do you know someone else who is flying and would like to know about this initiative? You’re receiving this newsletter because you are a registered supporter or donor. The crew at Journeys for Climate Justice are excited to have Kanchana Weerakoon return to Australia. Her last visit was in 2016. There are many opportunities to catch up with her during her visit between 6th and 30th April. This time, she's talking at the Tamil Feast on 10th April - see below for bookings. It's at CERES Environmental Park in Brunswick. More information soon on the next events - CERES gardening/nature workshops (9.30am Wed 17th) Lentil as Anything breakfast in Abbotsford (10am Sat 27th), Green Faith in Collingwood (5pm Easter Sunday 21st) and Earth@Peace conference in Parkville (23-24th, sold out). Stay tuned for more details via our website and facebook pages. 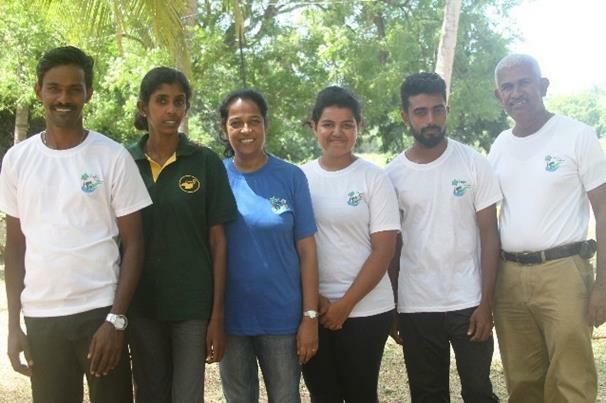 Kanchana is pictured (in blue top) with youth who led the 2018 Yanni Yathra. Kanchana will be speaking during the meal on Wednesday 10th. The event starts at 7pm. Book here - do it soon as these events fill quickly, and make sure you book the correct night. Here's the theme of Kanchana's talk: An experiential journey towards inner change and transformational leadership and bringing people together through food systems and action on climate change. I wonder if we can entice gardening guru Costa to come? He would love it. 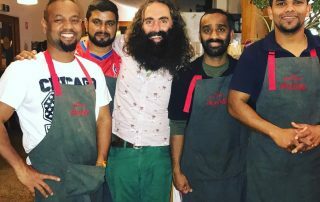 Pictured in centre with some of the cooks, he hosts Friday night's gardening show on ABC TV. JCJ continues to support great initiatives. Here's a snapshot about those initiatives and the work of some of the people connected to JCJ. Kate Gorringe-Smith is a keen JCJ supporter. Along with other artists, she organised the travelling photo exhibition The Overwintering Project. Internationally recognised pianist Elyane Laussade donated part-proceeds of a recent concert to the Carteret Islanders resettling on Bougainville. Kanchana will be a special guest at her next matinee concert and lunch on Thursday 11th April. Elyane will play pieces by Beethoven and Mendelssohn on piano with international violinist Andrew Sords and Luke Severn on cello. Email Elyane to book in if you would like to come. Cost is $50 cash. Venue is Elyane's home studio in Doncaster East. JCJ has a new committee. 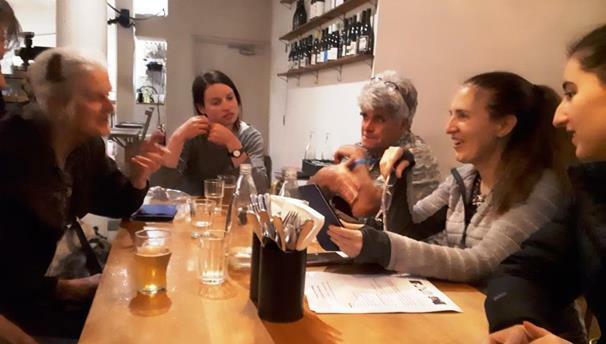 The photo shows long-time supporter Barbara Baird swapping stories with four committee members Sophie Schmidt, Tony Gleeson, Elyane Laussade (Treasurer) and Natalie Laussade-Long. Other committee members not shown are Kanchana Weerakoon (president), Jack Schmidt (secretary), Colin Long (vice-president) and Jim Crosthwaite. Have you flown or are you planning to this year? Flying releases carbon emissions into the atmosphere which contributes to climate change. Although many airlines offer you the option of offsetting your personal emissions, many of these schemes have limited impacts. Instead, why not donate to JCJ's alternative to carbon offsets scheme and support projects that make a real difference to vulnerable communities in Asia. For more on carbon offsets and alternatives, click here.